Home / Safety Bandana / Top 15 Uses for a Bandana! If you don’t have a bandana in your backpack or your pocket, you should! They have so many uses, plus they’re light and compact. You never know when it will come in handy, so why not be prepared? Fold a bandana diagonally and tie over your hair as a head covering. If you’ve ever seen a group of girls wearing bandanas on their heads and singing, I guarantee they’re Girl Scouts. It keeps your hair safer from campfire sparks and ticks. Roll or fold diagonally in a headband. It holds back your hair and sweat, and is also stylish! 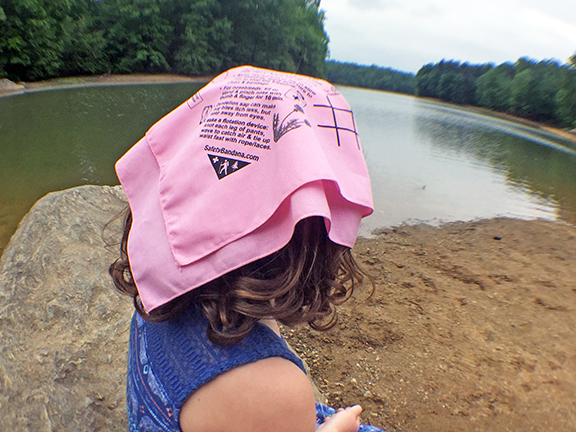 Cool off by wiping a wet bandana on the back of your neck and face. Tie diagonal corners of the bandana across your shoulder for an arm sling. Fold into a diagonal strip to make it longer, and wrap an injured ankle. Tie sticks along an injured limb to make a splint. Tie as a mask over your mouth to avoid breathing campfire smoke. Tie to a stick and use as a flag to signal for help. Use as a potholder while cooking. Use as a dishrag to clean your mess kit. Tie it to a tree for a trail marker. Filter debris from water by pouring it through a clean bandana (and then purify the water with tablets or by boiling). Make a hobo pack by tying the corners together diagonally. Twist the bandana tightly diagonally or rip off strips to use as rope or cord. Reference the outdoor safety and first aid tips on a Safety Bandana anytime you camp, hike or bike.